David Mamet and 4 A.M. | What is it? David Mamet and 4 A.M.
How does David Mamet’s 4 A.M. relate to the Toynbee Tiles? Well, the tiles promote the idea of resurrecting the dead on Jupiter through ideas found in the movie 2001 and the writings of Arnold Toynbee. Mamet’s play 4 A.M., which he describes as “a homage to Larry King” relates a conversation between a radio host, in conversation with a caller to his show promoting his idea to bring back the dead on Jupiter through the ideas found in the movie 2001 and the writings of Arnold Toynbee. As Justin Duerr said in Resurrect Dead, this is no mere coincidence. But how did it happen? Arnold Toynbee’s Conception of the Colinization of Outer Space, as depicted in the movie “2001 A Space Odyssey,” was first explained in a ‘call in’ on the Larry King Show in February 1980. February 1980 – April 1983: TTT repeatedly calls Larry King’s show with his idea. 1983: Mamet writes 4 A.M. I can bolster the case with other material, but is that really necessary? From the timeline alone, consciously or not, Mamet based 4 A.M. off of a conversation he heard between TTT and Larry King. Memory is fallible, so I’m going to give Mamet the benefit of the doubt when he says “I made it up” but the evidence says otherwise. For posterity, here’s the text of 4 A.M.
An announcer seated at a radio console desk. He wears earphones and speaks into a microphone. We hear the voice of the caller over a loudspeaker. Interviewer: Hello, you’re on the air. Caller: Hello, Greg, how are you? Caller: Good. Greg, it’s a pleasure to talk with you. I had the pleasure of talking to you three-and-one-half years ago, and I’ve been a continual listener of yours since you started out with the twenty-two stations, and I admire you very much. 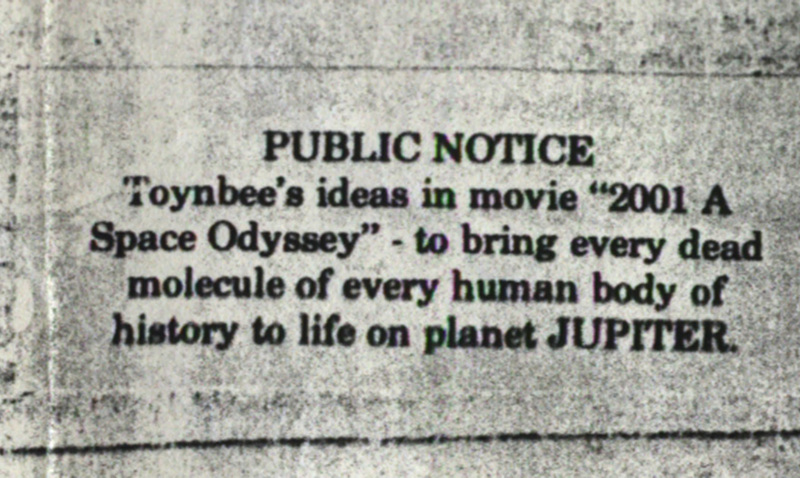 Caller: Greg: In the writings of Arnold Toynbee he discusses a plan whereby all human life could be easily reconstituted on the planet Jupiter. Int: Yes? (Pause.) I’m listening. Int: Yeah. I got it. Go on. Caller: We’d like to publicize our organization, Greg. We’re very young. We’ve just been existence over a year and we want to publicize our theory. And, Greg, we don’t know how. Int: You…how do you publicize your plan to bring dead people back to life on Jupiter. Int: Why? (Pause.) Why would you want to do this? (Pause.) Hello? Int: Why would you want to do this? (Pause.) You see what I’m saying to you? (Pause.) What is the aim of your group? Caller: I…Greg I told you. Int: You said that you want to bring dead people back to life. Int: On the planet Jupiter. Int: Well, I’m not sure that’s what the movie was about, but be that as it may, why would you want to do that? Int: Well, yes, I mean it. Why would you…what’s the idea…? You’re walking down the street, there’s AbrahamLincoln…is that the idea? Int: Naah…it’s to broad. It’s too broad. Don’t you see what I’m talking about? You can’t bring ’em all back. (Pause.) Can you? Int: Well, think about it. (Pause.) Think about it. You’re talking about billions of people. Eh? They’ve lived at different times. They speak different languages-the ones that speak our language, it’s changed over the years. Thedialects are different. Customs change. Their lives are different. Some of them died violent deaths…some aredisfigured…they’ve been decomposing…Now: listen to this: At what point do you bring them back? (Pause.) Right before they died? What if they were ill? What if they were infirm? And so you don’t do it then, when do you do it? At what point? You see what I’m telling you? Someone wants to come back at age twenty, so you bring him back at fifty-five…is he allowed to change? And who’s to say if he can or can’t? What if he never wanted to come back? Caller: He wouldn’t be in a space suit. Int: …whatever. And who governs this august group? Or do they just “get along”? Not in this lifetime, friend. What do you think? Because they’re on a foreign planet that it’s going to be cooperation and good will? They’re going to forget about their human nature and just live in joy? You’re talking about heaven, my friend. Heaven doesn’t exist. You think the fact that they’ve come back is going to make them all philosophers? I don’t think so. Far a day, yes. Maybe. A week, a month later, and I’m going to tell you something: It’s going to be worse than it was before, and you know what you’ve got? Chaos. And any tine you get a State like that you have a populace that thinks the world owes it a living. And you’ve got a tragedy. It doesn’t hold up. Even as a dream. It’s not thought out. And what do they eat? Caller: Toynbee says that we can bombard the atmosphere with oxygen and reclaim the soil. Int: Listen to me: The world is full of histories of people trying to live in Utopias. It doesn’t work. We wish it did, itdoesn’t. (Pause.) Alright? (Pause.) Alright? Int: Alright. Thank you for calling. (Loudspeaker goes dead.) Let’s move along.